A David Donahue Trim Fit Solid Dress Shirt from Nordstrom and a navy vertical striped three piece suit are strong sartorial weapons in any gent's sartorial arsenal. Black leather oxford shoes integrate well within a variety of looks. 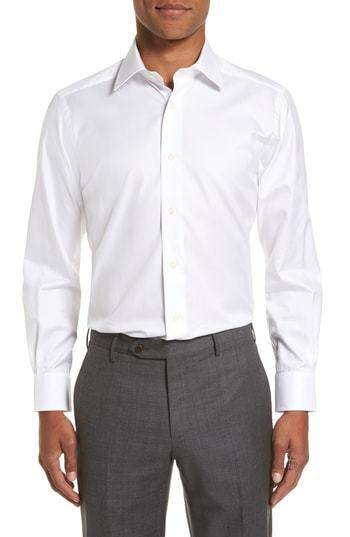 For a nothing less than incredibly stylish ensemble, reach for a David Donahue trim fit solid dress shirt from Nordstrom and black dress pants. 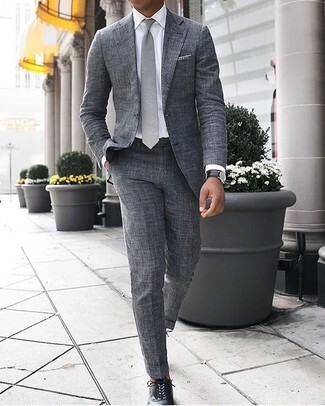 Make a David Donahue trim fit solid dress shirt from Nordstrom and a grey suit your outfit choice like a true gent. Add black leather oxford shoes to your getup for an instant style upgrade. This combination of a David Donahue trim fit solid dress shirt and yellow chinos is super easy to make up in seconds time, helping you look sharp and ready for anything without spending too much time going through your closet. You could perhaps get a little creative in the footwear department and lift up your look with dark brown leather tassel loafers. Try pairing a David Donahue trim fit solid dress shirt with a grey overcoat like a true gent. Choose a pair of black leather derby shoes to make the outfit current. For a nothing less than incredibly stylish look, choose a David Donahue trim fit solid dress shirt from Nordstrom and grey dress pants. For something more on the daring side to finish off this outfit, grab a pair of white leather double monks. For a nothing less than incredibly stylish getup, reach for a David Donahue trim fit solid dress shirt from Nordstrom and grey plaid wool dress pants. For a nothing less than incredibly stylish outfit, consider wearing a David Donahue trim fit solid dress shirt from Nordstrom and a beige trenchcoat. 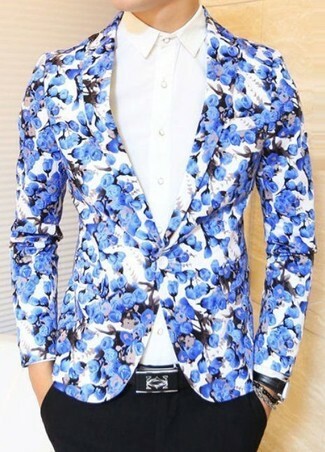 For a nothing less than incredibly stylish look, try pairing a white dress shirt with a black suit. 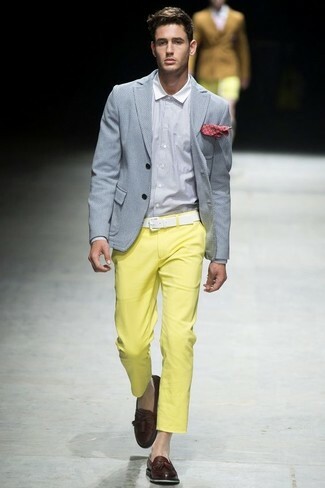 For something more on the daring side to complete this look, choose a pair of black leather derby shoes.